Help Sky the dog master all her cool puppy tricks, ready to perform at a special dog show. Lead her up the seesaw so she can slide down the other side. Take a run up to see if she can clear the jump without knocking the bar off. Now for the big finale—can she jump through the big hoop to get the bone? Price is 39% above the initial Lego retail price! This comes down to 11.21 cent per brick. The Puppy Playground (41303) Lego set is available from the sites below. However, they do not offer delivery to your selected region. The Puppy Playground (41303) Lego set is no longer directly available from the sites below. However, 3rd party partners of these sites might still have the set available. Alternate description Train for the big dog show with Sky the puppy! Includes a Sky the dog figure. Features a tilting seesaw, knockable jump, hoop jump with bone holder and a flag. Accessory elements include a dog bowl, two bones, dog biscuit and a bow. Help Sky climb up the seesaw then slide down the other side. Practice all the tricks and jumps to prepare for a special dog show. Give Sky a tasty treat for all her amazing skills. 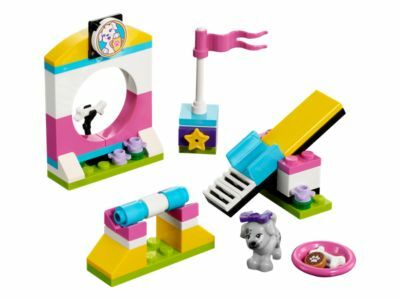 This set offers an age-appropriate build and play experience for ages 5+. Hoop jump measures over 2” (6cm) high, 1” (4cm) wide and under 1” (2cm) deep. Seesaw measures over 1” (3cm) high, 2” (6cm) wide and under 1” (1cm) deep. Combine with the 41300 Puppy Championship for an even bigger dog show.